It’s only March, but that’s a fine time to begin entering drafts, getting familiar with the player pool, and sharpening those draft skills. A steady dose of slow drafts as we march towards opening day allows us to discover the players that we favor, and those that we may want to avoid. By the time the REAL money drafts arrive in August and September, we’ve fine tuned our strategy and drafting becomes second nature. This post is a round by round breakdown of a 28 Round FFPC Best Ball Double Up league. 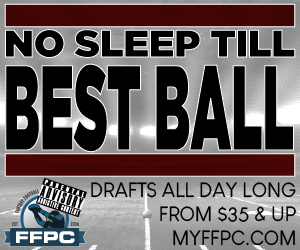 There are quite a few Best Ball offerings available these days, but few match the depth of the FFPC format. 28 rounds means more players must be drafted. We are not just grabbing the low hanging fruit at each position. We will go deeper at each position, and more rookies will be drafted overall. For those unfamiliar with the FFPC format, basically it is a PPR format, except tight ends get 1.5 points per reception AND players that score touchdowns on special teams, also get those points awarded to them individually. The weekly system optimized Best Ball lineup will consist of 1 QB, 2 RB, 2 WR, 1 TE, 1 K, 1 D and 2 Flex positions (RB, WR, TE). (Yes, we draft Kickers. Do not be scared. There IS strategy involved with kickers, especially when you are drafting in March and there is much uncertainty about who will own the job for each NFL Team). The Double Up prize pool means that top 6 teams (out of 12) in the league will be awarded TWO entries for the 2019 draft season, equivalent to the entry fee of the league they won. The draft we are tracking here has a $35 entry fee, and consists of some very experienced players in the FFPC format. General Thoughts: Team 1 “I Have No MOJO”: goes outside the box, drafting David Johnson #1 overall. His justification is that he is forward thinking, and not drafting based on last year’s results. It is the 1st time David Johnson has been drafted #1 in any of the 65 drafts we’ve logged so far. On his subsequent picks he grabs the best player available at WR and RB, giving himself some flexibility in his next two picks, which are a longggggggg way away. Team 4 “DudePlatinum”: I really like the two headed tandem of Zeke and McCaffrey. I could see McCaffrey outproducing Zeke this year. was awesome. So long as he is healthy, and with the upgrade at QB, there doesn’t seem to be much standing in his way for a productive campaign. Minimally, the two picks provide a high floor, and in this double up format, you are putting yourself in a position for success I would say. Team 8 “Avada Kamara”: Apparently this owner likes Alvin Kamara (who would have guessed)? Interestingly he bucks the general 2018 consensus of drafting Travis Kelce as the first overall tight end per our FFPC ADP and snags Rob Gronkowski instead. We’ll see how this pans out. Team 11 “Cromarties Daycare” and Team 6 – Achillobator : Both teams shun the “draft RBs early in 2018” mantra and grab themselves 2 elite wideouts. It will be interesting to see how their RB corps pans out. Team 12 “My Wife Left Me”: Grabs two undisputed workhorse #1 backs on good teams. Having landed the 10-12 pick myself a few times this year, I have done the exact same thing. You are getting two stud RB’s in a shallow pool of top backs in 2018. Very solid way to start. ** My Picks ** – I had actually queued up Zeke before Antonio Brown at the 5 spot, but I’ll take the consolation prize of Antonio Brown. There isn’t any reason to believe his production will slide in 2018. My second round pick was a tougher decision. Travis Kelce is unexpectedly on the board thanks to Rob Gronkowski going off as the first tight end. I was actually hoping Christian McCaffrey would make it back, as I think he can be a top 5 RB this year with Jonathan Stewart out of the picture and a generally weak receiving crew in Carolina. In the end I took Kelce. I have played the ‘wait on tight end’ a few times in other drafts this year and have been generally disappointed in what I ended up with. I cannot pass up Kelce here. I had a lot of success last year in leagues where I grabbed him in FFPC formats (Tight Ends get 1.5 PPR). The thing about tight end in FFPC leagues is that though there is an ADP, the variance on when they get drafted is very high. Sometimes there are runs early on them, and other times they seem to linger. If you “plan” when to take your tight ends, it seldom works out that way. I’ll argue that I know have the #1 option at both the TE and WR position. I think Mahomes will lean on Kelce (like a lot of young QB’s), and am not terribly concerned about the presence of Watkins. He’s just another viable threat that may open up Kelce some more. General thoughts: Teams continue to fill out their rosters, and you see the beginnings of their roster construction philosophies begin to take hold. Already at the beginning of round 3, any running back considered to be a “workhorse” for their team is gone. We’re in timeshare territory already. Team 1 – Keeping to a balanced approach, “I Have no MOJO”, grabs one of the elite timeshare backs in Devonta Freeman, then follows up with two high upside candidates in Josh Gordon and Juju Smith- Schuster. The ADP on Gordon is slipping a bit of late as we can see in the ADP histogram that you can access for every player in our ADP charts. The addition of Jarvis Landry seems to have affected his value. Team 2 pulls off an interesting move, grabbing both pieces of the timeshare in the Tennessee backfield in Derrick Henry and Dion Lewis. On paper it’s a sound approach, however when you use 2 of your top 4 picks to do this, it comes at a very high price. I can recall doing this in the past when the Theo Riddick / Joique Bell tandem was a thing. It didn’t pan out for me as well as I thought when you had to pay a high price for both pieces. But we shall see, best of luck to Team “Physicality 14” on this. Team 3 “100% Juice” (I hope not a tribute to O.J.) adds Baldwin and Jay Ajayi. Again, leaving him with a balanced 2 RB / 2 WR squad moving forward. Ajayi is a question mark for me. Pederson rotates his backs too much to provide any one of them the opportunity to generate huge fantasy scores consistently on a week to week basis. While Blount is gone, Corey Clement’s role will increase. I continue to like what’s going on with Team 4 “Dude Platinum”. Zach Ertz falls into his lap at 3.4. Ertz could easily end up as the #1 TE this year. And with his 4th pick he grabs Demaryius Thomas, who I am high on myself. Thomas was quietly a consistent producer last year, even with the garbage QB situation. With “Case Keesum” in town, there’s no reason to expect he’d finish outside the top 15 at WR. I’m drafting at the 5 spot, and there I grab Mark Ingram, the cheaper option of the New Orleans backfield. Last year Ingram was the #6 RB, and we get him here as the 15th RB off the board. In that offense he should still yield a handful of huge games (he had 3 with 30+ points last year), yet provide a solid floor weekly (he only failed to score 10 points 3 times). On the return in the 4th round, I grab Larry Fitzgerald. Drafting Fitzgerald is like buying Apple stock (AAPL). It’s not exciting but you know you are invested in a market leader. The shaky QB situation is a concern. It’s just a matter of when the super fragile Sam Bradford will get hurt (put some meat on them bones boy), but it’s all about Fitzgerald in the wideout crew there (David Johnson will get his out of the backfield). Mike Clay has him down for 168 targets this year. Fitz has been able to produce with bad QB play in the past, and even if the QB situation goes terribly wrong, I’m thinking that he won’t mail it in. The guy is a professional. After a WR/WR start, Team 6 grabs their first RB in Kenyan Drake and tight end Kyle Rudolph. Rudolph should continue to be great in this format with Kirk Cousins getting him the ball. Cousins likes to throw to his TE’s for sure (Reed/Davis). Drake is still a bit of a mystery with a small body of work, and with Frank Gore coming to town in Miami, that doesn’t clarify the situation. Team 7 “SpreeAtLast” hits the trifecta, going with his 3rd consecutive RB (Joe Mixon) to start the draft. All 3 are second year standouts. There is a definitely a lot of upside here if each one plays out with a “best case scenario”. Following up that pick with Greg Olsen is a safe option, especially with the rumors of leaving for a broadcasting gig seemingly put to rest. Though he has no WR’s as of yet, quantity over quality is a viable approach in the best ball forma. Team 8 drafts his first 2 wideout in rounds 3 and 4, adding TY Hilton and Brandin Cooks. With Gronk already on the team, he now has the two top passing targets of Tom Brady, and the top target of Andrew Luck. Well done. Jordan Howard and Stefon Diggs are added to Team 9’s squad. I was very down on Howard before free agency, but the addition of all the talent to the Bears should keep defenses honest and not stack the box on Howard. I would have drafted him myself, if Ingram was gone at the 3.05 spot. Team 10 “T-Fun” adds Thielen and McKinnon to his team (Vikings fan?) giving him a 2 RB/ 2 WR start. Though Thielen was responsible for a lot of teams getting to the fantasy playoffs last year, many will remember the eggs he laid during weeks 15 and 16, letting us down. He was on a lot of 2nd and 3rd place teams I’m sure. Nonetheless, he’s a solid pick. McKinnon is the apple of Kyle Shanahan’s eye, and his ADP has skyrocketed since his creepy and uncomfortable comments came out, literally fantasizing about “how I would use him and the stuff that we would do”. He’ll be a productive PPR back in San Fran for sure, with a Devonta Freeman like role slated for him. Now you’ll usually only see what Team 11 did in the FFPC format, as he uses 2 early round picks to go back to back TE with Evan Engram and Jimmy Graham. Personally I’m curious to see if Evan Engram will be as productive with Odell Beckham back in the mix. And with Jimmy Graham there seems to be some dissention in the fantasy community. It’s a great landing spot in Green Bay. It may be a feast or famine type of situation week to week for Graham, but we’re talking about total points accumulated over the year in Best Ball, you’re not guessing when the big weeks will come. Closing out the review with Team 12, after grabbing 2 RB’s to start, they balance it out with 2 WR’s in Amari Cooper and Allen Robinson. The situation for both players is good. Most are hoping Gruden can turn Cooper into that elite performer on a consistent basis. Robinson is the main target in Chicago, so let’s hope Trubisky plays as advertised.